Ubisoft have finally fully unveiled Far Cry 5 in all its glory, with an explosive trailer full of big guns, loud bangs, and fast vehicles. It looks like business as usual for the series then, not that that’s a bad thing – Ubisoft have intense and rewarding action gameplay down to a fine art when it comes to Far Cry, and I’m looking forward to heading to Montana next year. In all the chaos of the main trailer (which is just above in case you missed it), Ubisoft also released three short videos shining the spotlight on some of Far Cry 5’s major players. Nick, Jerome, and Mary were all briefly seen in the trailer, but you can get them to know them better below. The title of the videos suggest they’re a resistance of sorts – we’re told they’ve risen up to combat religious militia that appears to have taken over. Note that none of the characters above are the game’s main character – a currently unnamed Sheriff’s deputy – but the trio will doubtless provide key assistance throughout the main story. As the new junior deputy of fictional Hope County, Montana, players will find that their arrival accelerates a years-long silent coup by a fanatical doomsday cult, the Project at Eden’s Gate, igniting a violent takeover of the county. 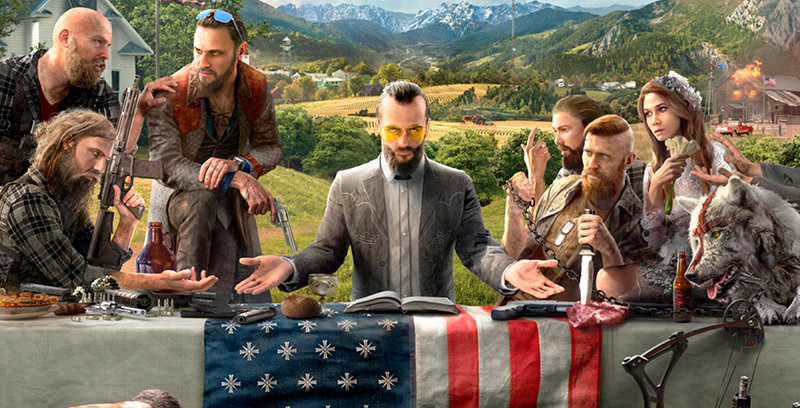 Caught off guard and drawn into a power struggle, players must disrupt the carefully laid plans of the Project at Eden’s Gate, and fan the fires of resistance to help liberate the Hope County community and themselves.Under siege and cut off from the rest of the world, players will join forces with residents of Hope County and form the Resistance. The fight against the cult will take players to unique locations throughout Hope County that provide different gameplay experiences. During their journey, players can fly planes to engage cult forces in aerial dogfights across Big Sky Country. While tracking down cult members and gathering resources for survival across farmland, forests, mountains and rivers, players can get behind the wheel of iconic American muscle cars, big rigs, ATVs and boats. Vehicles also provide refuge when under attack by animals or as a way to quickly escape when things don’t go as planned. Far Cry 5 comes to PlayStation 4, Xbox One, and PC on February 27, 2018.